These heaters are lightweight and portable and provide convenient solutions to many heating applications. 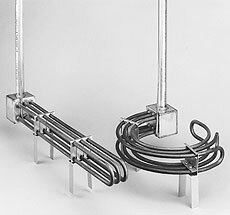 TLC Series heaters have two or three straight heating elements, while KTLC Series heaters have two or three curved heating elements. For clean water heating applications (pH 6 to 8). * Designate voltage, i.e. insert 240 for 240 for 480 for 480 V.